"Reuben, you are my firstborn, my might, the first sign of my strength, excelling in honor, excelling in power. Turbulent as the waters, you will no longer excel, for you went up onto your father's bed, onto my couch and defiled it." "Let Reuben live and not die, nor let his men be few." 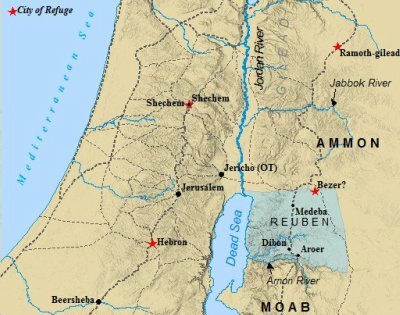 The Reubenites were one of three tribes (Gad, East Manasseh) occupying land east of the Jordan River. These three tribes became known as the Transjordan Tribes. The tribe of Reuben, as well as those of Gad and East Manasseh, were known for their large herds and flocks. They, thus, required much grazing land. As the Israelites defeated Og and Sihon, and then conquered Midianite chieftains, representatives from these tribes approached Moses (see below) to seek this land. Moses' allotment to the Reubenites is given in Joshua 13:15-23. "This is what Moses had given to the tribe of Reuben, clan by clan: The territory from Aroer on the rim of the Arnon Gorge, and from the town in the middle of the gorge, and the whole plateau past Medeba to Heshbon and all its towns on the plateau, including Dibon, Bamoth Baal, Beth Baal Meon, Jahaz, Kedemoth, Mephaath, Kiriathaim, Sibmah, Zareth Shahar on the hill in the valley, Beth Peor, the slopes of Pisgah, and Beth Jeshimoth..."
The towns listed can be seen on the map below. One notices The Kings Highway ran through the middle of Reuben's allotment. The major cities of Dibon and Medeba thrived due to their location on this great, ancient highway. Interestingly enough, it may be these specific allotments and boundaries which can prove, in the very least, the geographical legitimacy of the narrative. Na'dav Na'aman used the boundaries allotted to Reuben in his essay entitled, Rezin of Damascus and the Land of Gilead. In this essay Na'aman is comparing the demarcation of the Transjordan during the Assyrian conquest, to similar boundary allotments found in the Old Testament of the same area. He uses the Jephthah story in Judges 10, and also makes reference to Jacob and Laban facing off in Canaan, and the tribe of Reuben and their land allotment. The Assyrian conquest of the seventh century B.C. was led by King Tiglath-pilesar III. Two inscriptions remain concerning the boundary delineations of the Transjordan by Tiglath-pilesar, known by Pul in the Bible (see below). It is Na'aman's argument that the boundary system established by the Assyrian king "followed the earlier configuration of borders" of this area. Na'aman further argues "that this boundary system, which was established no later than the 8th century and survived up until at least the late seventh century B.C., appears in the Bible and can be traced in numerous biblical descriptions that depict pre-monarchial Israel". This statement was made by one of the world's leading experts on the subject. The implication is the stories concerning the Patriarchs of the Bible are, if nothing else, geographically reliable. Tiglath-pileser campaigned in Canaan during the 730's B.C. Thus, these boundaries were well known to the local inhabitants prior to the 8th century B.C. The tribe possessed the treasured tableland, or, in Hebrew "Mishor", as part of their allotment. This land was much more fertile than the rugged territory south of the Arnon River. The Moabites lived in this southern region, and they sought control of the Mishor as well. The two countries clashed frequently over this area. The borders Tiglath-pileser assigned to the Mishor are exactly as those given to Reuben. These boundaries, Na'aman concludes, were well known to the Biblical authors. Na'aman further states they took these boundaries "as a basis for the anachronistic depiction of the territorial reality of various episodes in the pre-monarchial history of Israel". The Mishor was suitable for the herds and flocks of the Reubenites. They grew wheat and barley crops in the fertile soil. The Reubenites and the tribe of Gad were friendly and intermingled with each other. Numbers 32:34 lists several cities within Reuben's territory built up by Gadites. Verses 21-23 list the kings defeated by the Israelites in order to obtain the land. Scripture mentions the "entire realm of Sihon king of the Ammonites, who ruled at Heshbon" was within the Reubenites territory. Moses is also credited with defeating the Midianite chiefs Evi, Rekem, Zur, Hur and Reba, "princes allied with Sihon". The passage concerning the tribe concludes by stating their boundary was the bank of the Jordan River. This boundary lay just west of the town of Beth-jeshimoth. 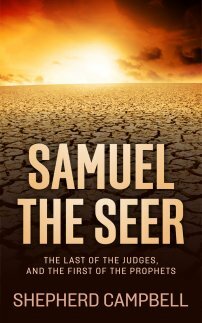 E. Bendor Samuel illuminates the tribes of Israel like no other in his work entitled, Israel and the Blessing of the Tribes. He discusses the trials and tragedies, the triumphs and achievements, the sins and shortcomings of God's people. The Bible illuminates the tribes in a light of full disclosure, and Samuel explores that light in this wonderfully insightful book. Click on the link to visit Barnesandnoble.com! Numbers 2 lists the order God gave Moses in which the 12 tribes of Israel are to encamp around the Tent of Meeting, and the order which they are to break camp. The orders concerning Reuben are given in Numbers 2:10-16. The tribe of Reuben is to camp on the south side of the Tent of Meeting. The leader of the "people of Reuben" is said to be Elizur, son of Shedeur. His division is given as 46,500 men strong. 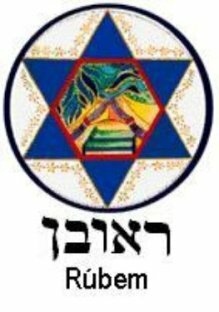 The tribe of Simeon is to camp next to Reuben, and next to them is the tribe of Gad. Scripture relates all the men "assigned to the camp of Reuben" is 151,450 men. The Biblical list of the number of Israelites coming out of Egypt, and the subsequent lists of tribal numbers, are subjects of debate. It is widely agreed upon these numbers are a result of a mistranslation in the King James Version. 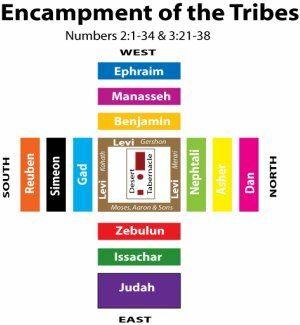 The tribe of Reuben was to break camp second, behind the division assigned to the tribe of Judah. This would appear to mirror the future importance of the tribe of Judah. It would also appear the Reubenites were already shrinking in significance. Reuben was the firstborn son of Jacob and Leah. His birth is recorded in Genesis 29:32. "Leah became pregnant and gave birth to a son. She named him Reuben, for she said, 'It is because the Lord has seen my misery. Surely my husband will love me now." Scripture recorded in verse 31 the Lord opened Leah's womb because He "saw that Leah was not loved". Thus, his name translates, "see, a son". Reuben first appears in Scripture outside of his birth in Genesis 30:14-17. In this passage, Reuben is said to have come in from the fields with some mandrakes, and given them to his mother, Leah. Mandrakes were an interesting fruit. The mandrake was a small, orange colored fruit. In ancient times it was thought of as an aphrodisiac, and a promoter of fertility. Its large roots have also been used as a narcotic. In this view, it is easy to understand why Rachel, the barren wife of Jacob, would seek to obtain the fruit thought to promote fertility. Leah, spitefully, held it over her head. Rachel, thus, offered Leah to sleep with Jacob that particular night, in exchange for the fruit. Leah agreed, and the subsequent night resulted in the birth of Isaachar. This would not be the only episode of a sexual nature involving Reuben. Genesis 35:21 records Reuben had gone in with Rachel's maidservant, Bilhah, and slept with her. Jacob heard of it, and this would lead to Reuben being stripped of his birthright as eldest. Jacob's Blessing/Curse of Reuben was a direct result of this act. Reuben, however, was the son of the Jacob responsible for convincing the other ten not to kill Joseph. Genesis 37:21 indicates Reuben swayed them from their original intention, and to instead throw him into a cistern. Reuben, according to Scripture, did this in order to later come back and rescue Joseph. Only when he came back, Joseph was gone. In the Joseph narrative, it was Reuben who guaranteed the safety of Benjamin to Jacob. In Genesis 42:37 Reuben offered the lives of his two sons if he failed to bring Benjamin back safely. In the early narratives concerning Jacob's sons, it is Reuben mentioned most (Gen. 30:14; 35:22; 37:21; 42:22, 37). This is not surprising, as Reuben was the oldest son of Jacob. However, upon the Exodus from Egypt, and the subsequent conquest, the tribe of Joseph seems to take on prominence over the tribe of Reuben. This is in fulfillment of Jacob's Blessing concerning Reuben and Joseph. The tribe of Reuben received very little word of encouragement from both Jacob and Moses. The Song of Deborah also had very little good to say about the tribe of Reuben. "...In the districts of Reuben there was much searching of heart. Why did you stay among the campfires to hear the whistling for the flocks? In the districts of Reuben there was much searching of heart." This was an accusation against the tribe of Reuben for their failure to participate in Deborah's war against Sisera. Instead, they stayed "among the campfires", displaying an attitude of indifference towards their brethren. The opening verses of Numbers 32 depict representatives from the tribe of Reuben and Gad going before Moses. Israel had previously defeated the Nephilim kings Og and Sihon , and their lands east of the Jordan. Moses granted them this land only on the condition they would continue to fight for the land west of the Jordan River as well. His warning to them was stern in verse 32. "But if you fail to do this, you will be sinning against the Lord; and you may be sure that your sin will find you out." Scripture records nothing further of the tribe of Reuben and their involvement in further conquest. Taken in context with the Song of Deborah, and Moses' scant blessing, it would seem the tribe of Reuben had lost its significance. The only exploits concerning the tribe of Reuben are mentioned in I Chronicles 5. The Reubenites, with the help of Gadites, and the half tribe of Manasseh, conquered the Hagrites during the reign of Saul. From the Hagrites, the tribe of Reuben seized: 50,000 camels; 250,000 sheep; 200,000 donkeys; 100,000 slaves. Over time, all three tribes east of the Jordan River fell into apostasy. This brought forth God's judgment in a most severe way. The demise of the tribe of Reuben is found in I Chronicles 5:24-26. "These were the heads of their families; Epher, Ishi, Eliel, Azriel, Jeremiah, Hodaviah and Jahdiel. They were brave warriors, famous men, and heads of their families. But they were unfaithful to the God of their fathers and prostituted themselves to the gods of the peoples of the land, whom God had destroyed before them. So the God of Israel stirred up the spirit of Pul king of Assyria, who took the Reubenites, the Gadites and the half tribe of Manasseh into exile. He took them to Halah, Habor, Hara and the river of Gozan, where they are to this day." Pul is the Assyrian king Tiglath-Pilesar, mentioned above. Thus, the tribe of Reuben was conquered and exiled, one of the first of ten tribes to undergo such a fate. This exile took place nearly two hundred years before the Babylonian king Nebuchadnezzar would sack Jerusalem, and exile its occupants to Babylon. The tribe of Reuben, thus, seemed destined to be Israel's leading tribe. 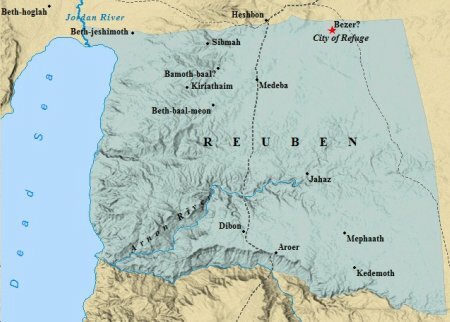 The transgressions of Reuben, Jacob's oldest, and later the transgressions within the tribe of Reuben, would ultimately lead to the exile and enslavement of its people by the Assyrians. This demise was foretold by Jacob, a consequence of Reuben's sexual deviance with Bilhah.